On the Home tab, click Failover Plan and select VMware vSphere. Open the Home view, in the inventory pane select Replicas. In the working area select one or more VMs, click Add to Failover Plan > New Failover Plan on the ribbon or right-click one or more VMs and select Add to failover plan > New Failover Plan. In this case, the VMs will be automatically added to the failover plan. You can add other VMs to the failover plan when passing through the wizard steps. Open the Inventory view, in the working area select one or more VMs, click Add to Failover Plan > New Failover Plan on the ribbon or right-click one or more VMs and select Add to failover plan > New Failover Plan. In this case, the selected VMs will be automatically added to the failover plan. 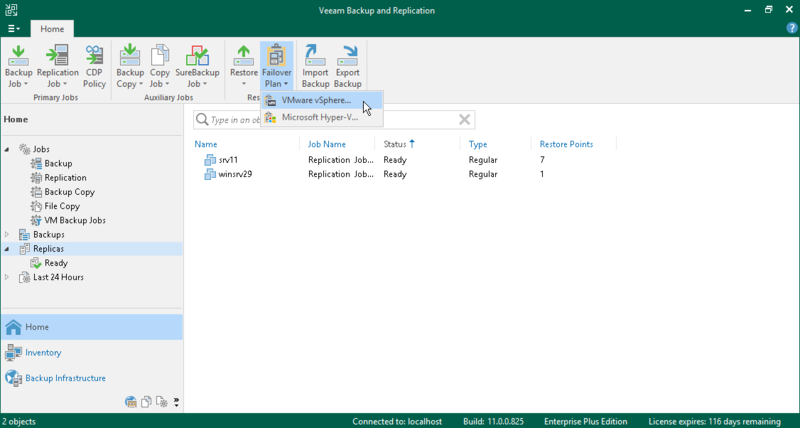 You can add other VMs to the failover plan when passing through the wizard steps.